During his 25 years in Security Management, he has spearheaded the creation, writing, and implementation of new policies and programs on such topics as Workplace Violence Prevention, Hotel Security, Casino Security and Surveillance, Crime Prevention, Emergency Preparedness and Business Continuity, Drug Recognition, and many others. 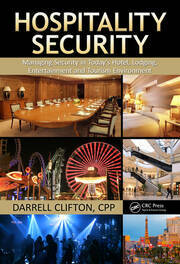 Darrell Clifton, CPP, is Director of Security at Circus Circus Hotel Casino in Reno, Nevada. During his 25 years in Security Management, he has spearheaded the creation, writing, and implementation of new policies and programs on such topics as Workplace Violence Prevention, Hotel Security, Casino Security and Surveillance, Crime Prevention, Emergency Preparedness and Business Continuity, Drug Recognition, and many others. Clifton chairs several community and national organizations, including the Downtown Police Tax District, Alcohol Advisory Board, Washoe County Business Preparedness Committee, and the Northern Nevada Chapter of American Society for Industrial Security (ASIS). He also sits on the board of directors for Secret Witness, AlertID, and is the vice chairman of the Hospitality, Entertainment and Tourism Council. He is a frequent contributor to Security Magazine, Casino Journal, and a speaker at ASIS; Reed Exhibitions; University of Nevada, Reno; University of Nevada, Las Vegas; and Gamepath. Clifton is also a FEMA-certified Continuity of Operations Manager and participates in several state task forces to plan, write, and implement Continuity of Operations (COOP), Continuity of Government (COG), and other emergency plans. He was named by Security Magazine as one of the most influential people in the security industry.